From April 1st 2017, Haringey Council has awarded management of Wolves Lane to OrganicLea. The Palm House is closed to the public for regular visits until further notice. Some new activities, however, have now begun at Wolves Lane – see our What’s On page for details. Contact OrganicLea to find out when the Palm House will open regularly again at info@organiclea.org.uk and at 020 8524 4994. 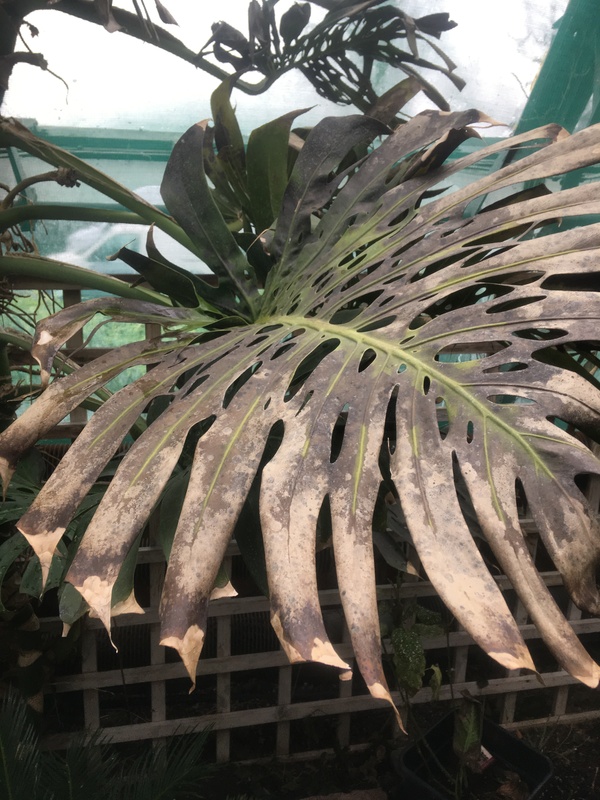 The Friends fully support the volunteers working to maintain the Palm House but are aware that remaining plants could be damaged without forward planning or tropics-specific knowledge. They are extremely concerned about the lack of any strategic plan for the future of the Palm House, Desert area and Rainforest area. 1. the application of shading to reduce sun burn on high up leaves in the Palm House. 2. The rain forest ‘trees’ are all dead and the remaining plants are being scorched. What is the ongoing purpose for the rain forest? 3. The desert area has lost its largest cacti and now looks very dilapidated. Much work is needed here too. Maintenance should be the key activity until a plan has been formulated for the community areas (and site as a whole) and approved by Council officers (the owners of these plants). The Friends are in contact with Councillors and Council officers about these issues. This newly formed group has begun work with the intent of restoring the Palm House. The work is in its early stages, following significant damage done in Winter 2017 due to lack of heat and some broken windows. Much work is still to be done. The Group is looking for volunteers. If you would like to help out, please come to Wolves Lane Centre on Tuesdays at 11 a.m or contact Lynda or Roger at wolveslaneworkshop@gmail.com or on 07771 995696. Do you have any canna, banana, small palms, lantana or strelizia? Donations of cuttings, seedlings and plants are gratefully received. Good news: the Koi and the Terrapins have survived, thanks to the devoted care of a staff member who worked for many years at Wolves Lane up to and prior to the handover in April 2017, and who continues to care for them today. Representatives of the Friends met with MP Catherine West and the Councillors. All were very positive about moving things forwards. MP Catherine West is keen to raise Wolves Lane issues with Haringey’s new CEO. She regards the Centre as an essential ‘green lung’ in the borough. 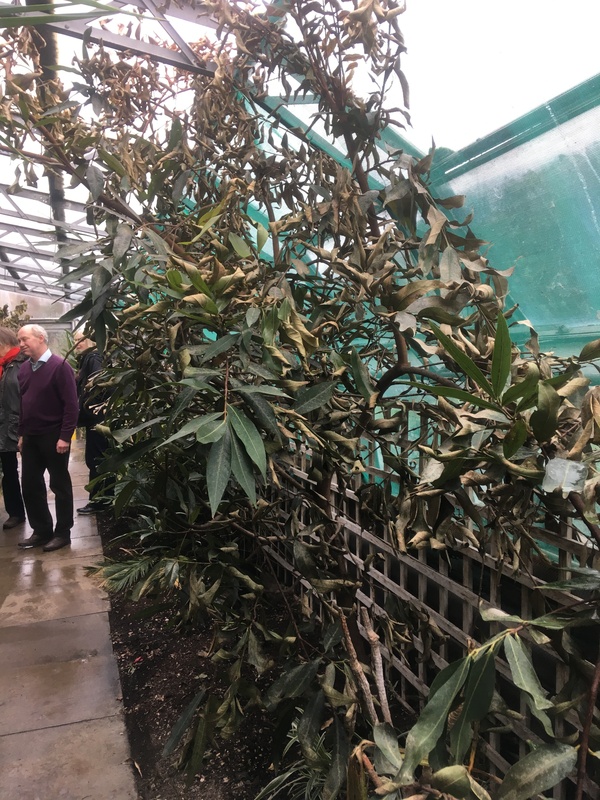 After working with MP Catherine West, Haringey Councillors and Haringey Parks, funds have also been found to replace damaged plants in the Palm House. 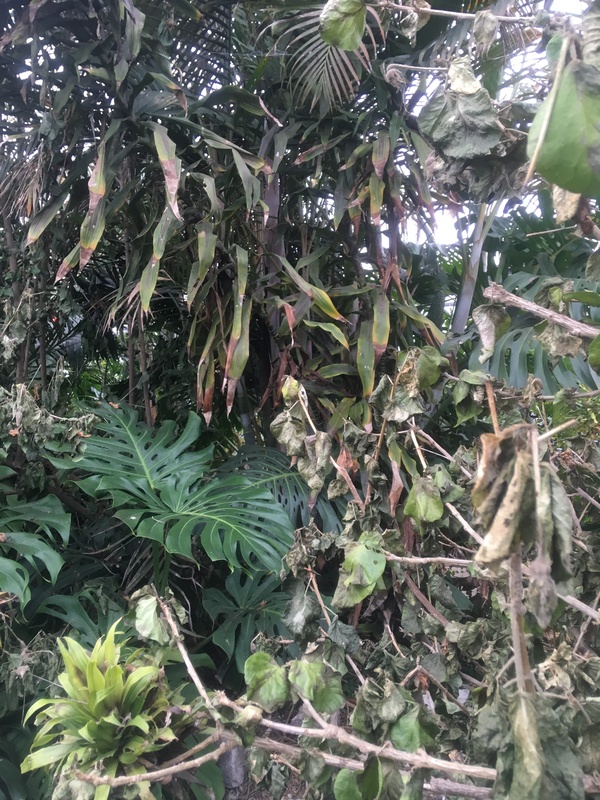 A Tropical plant expert has toured the Palm House and was thought to be preparing a report. However, a London Grown representative told the Friends that she took notes during the expert’s visit rather than there being a report from that expert. A plan to reactivate the heating service was also promised to be in progress by a Haringey Parks representative. 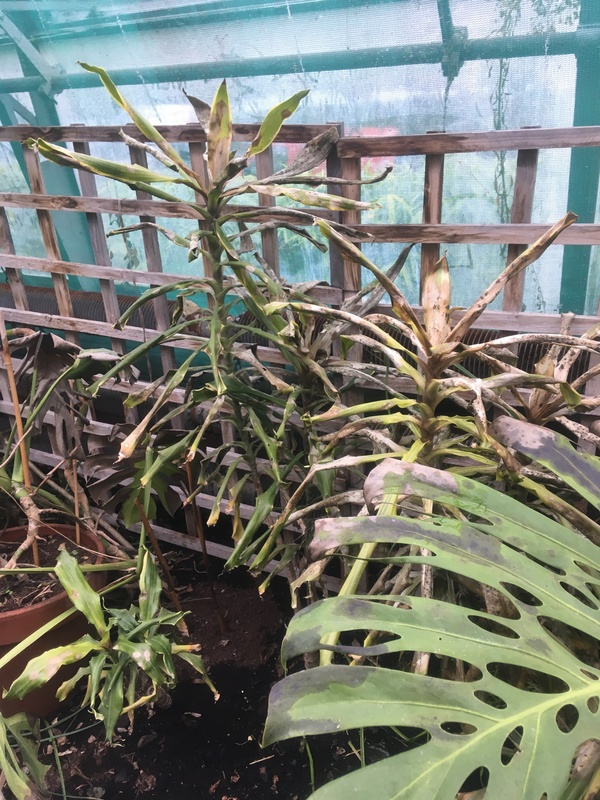 Unfortunately, many plants in the Palm House have deteriorated since the facility was closed to the public. The Friends are very concerned about this deterioration and damage to this important community resource. The Friends are working with Councillors, MP, Parks Department, Organic Lea and other stakeholders to resolve this situation as soon as possible. The Palm House is closed to the public for regular visits until further notice. see our What’s On page for details! 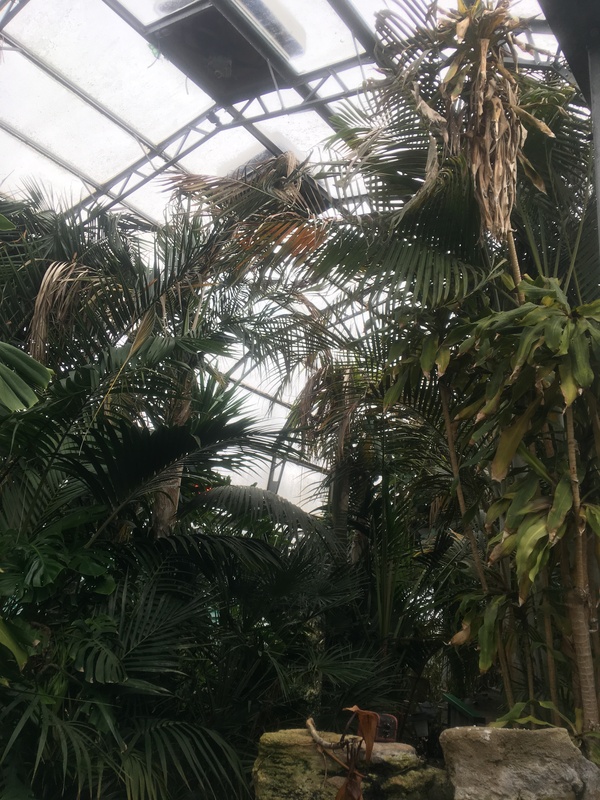 “Come visit the only Palm House in North London! It’s waiting for you at Wolves Lane Centre. The tranquillity of the Palm House in one of our green houses can be enjoyed by wandering amongst the Palm trees and giant ferns. Tropical birds, terrapins, goldfish and giant koi swimming in the running streams can all be seen. 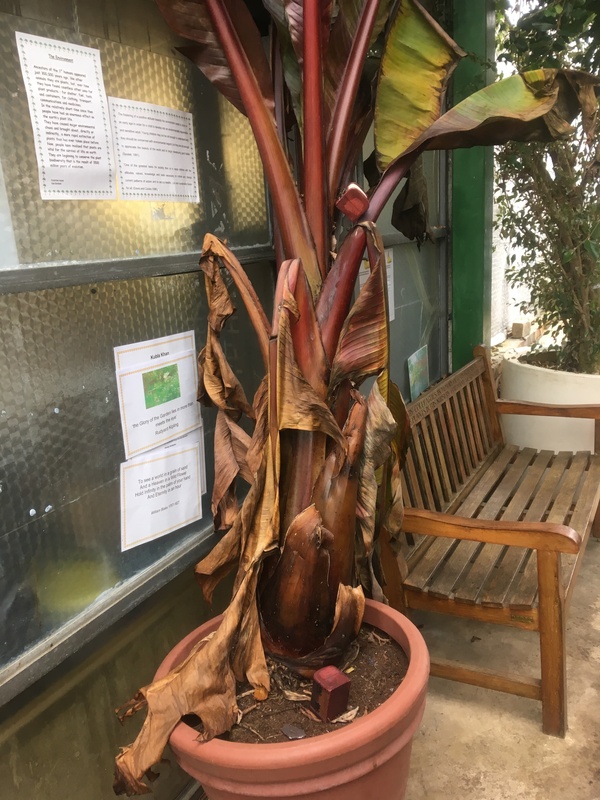 In summer, vibrantly coloured tropical butterflies flutter through the Palms, and surely this is the only place in Wood Green where bananas can be seen growing on a banana tree! Don’t despair – watering, pruning, glass repairs and above all the spring (even with such a brutish April and the Gulf Stream at a 1600 year slow!) 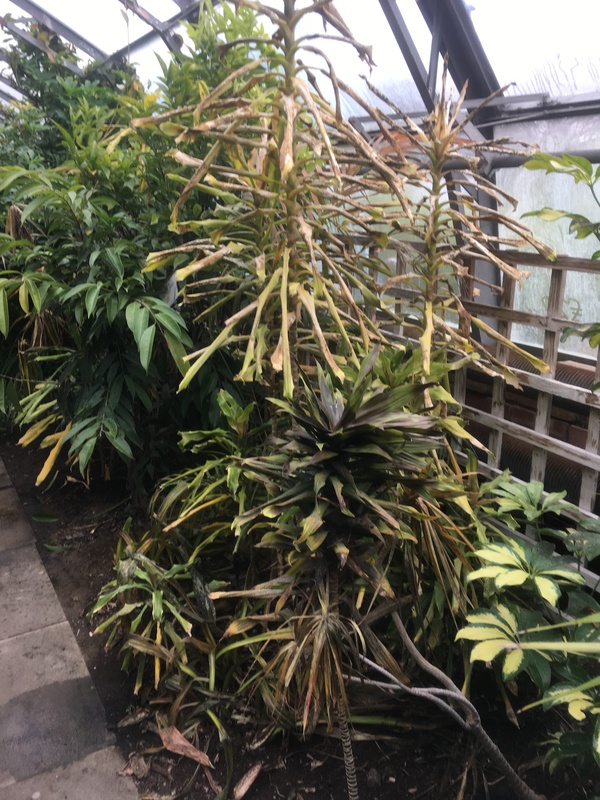 are now helping the palm house to recover. New shoots are appearing even on some plants that looked dead a fortnight ago. The strelitzias and jasmine are starting to flower and the Swiss cheese plants, the creeper by the entrance and several types of palm are showing lots of growth. Alas we have lost the banyan, probably the banana tree, and the hibiscus bushes. The fish are still swimming and the terrapins still sunbathing. Let’s try to fill in the gaps and restore this beautiful place to its full potential. Donations of a few well sprouted avocado pips, rooted passion flower cuttings, morning glory seedlings or anything else exotic would be most welcome. Thanks for the update and for your help! I’ll let everyone know about the need for donations of well sprouted avocado pips, rooted passion flower cuttings, morning glory seedlings or anything else exotic! The Friends look forward to a positive plan for all the community houses – the Palm House, Desert Garden and Rain Forest. 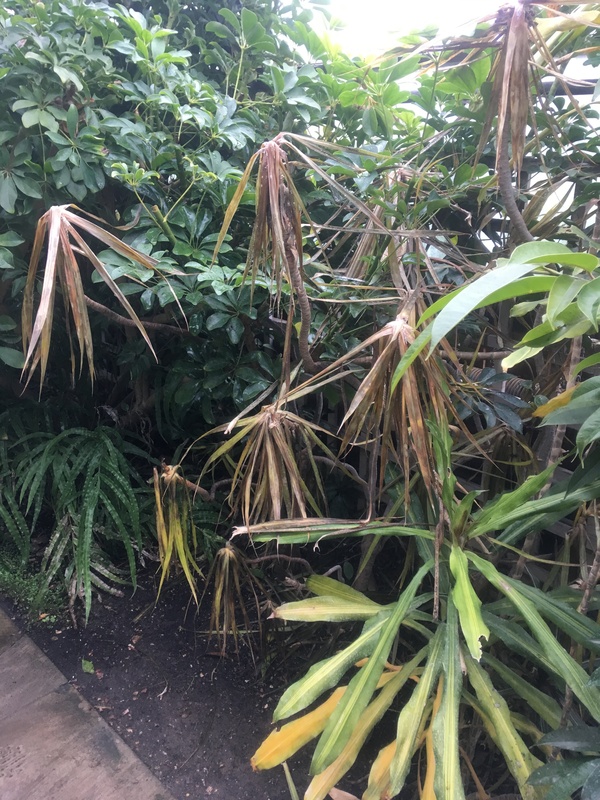 It is sad though that, but for a simple action of getting the heating working before the Winter, so many magnificent, mature exotic plants, like the banyan tree, hibiscuses, bananas, dracaenas and lantanas have died. Those like the jasmine, Australians and hardy palms are surviving because they need little protection. The rain forest has been destroyed. Not one weeping fig in it or the Palm House has survived. This was one of the most important educational elements of the Centre and has gone. 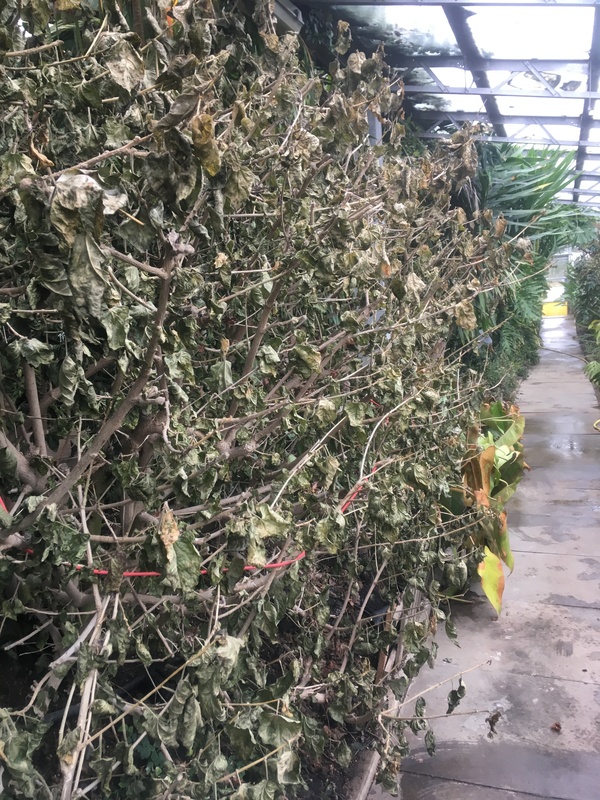 All the tallest euphorbias in the Desert Garden are dead or dying along with so many other plants which could not survive cold combined with damp. In the Palm House the most urgent priority is shading for the surviving plants. They were scorched last Summer because this was not done. So much protective foliage has now been lost or cut back and hence they are so much more vulnerable. A plan for all the areas is essential. 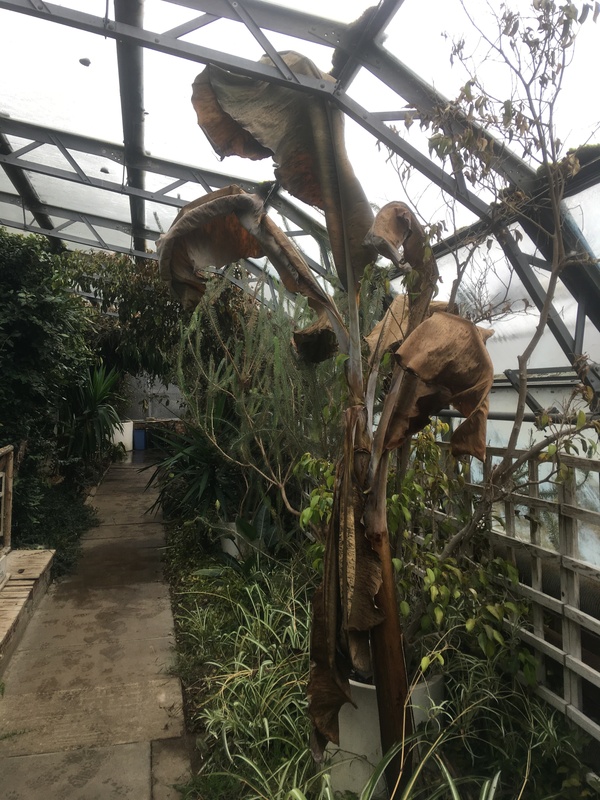 It will require both detailed knowledge of the remaining existing plants, including the chances of their survival, and how they could be integrated into a rejuvenated set of environments for the public to enjoy. Do come to the Centre on the 7th to see it for yourself. There has been so much revival in the palm house in the last few weeks it’s a delight – do come and see on Sunday! The blue creeper on the trellis as you go in is one of at least 10 species that have burst into bloom during the heatwave. The strelytzias were abundant but have now finished – there will be ripe seed available soon for anyone who wants to try growing their own. 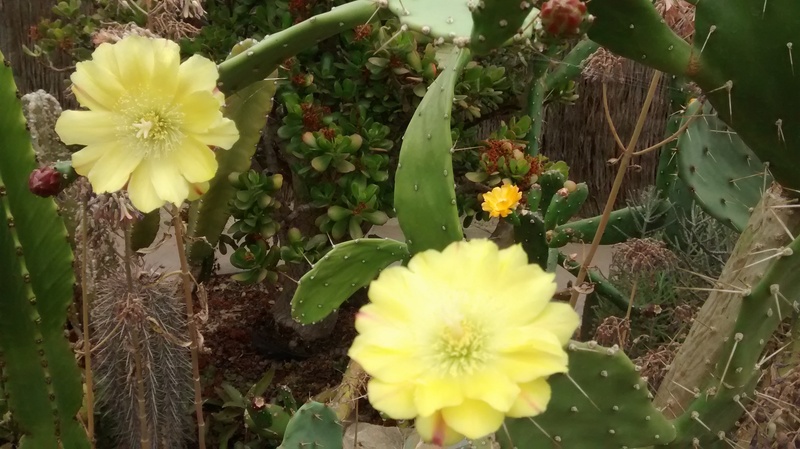 The prickly pear flowered in June as did another beautiful scarlet cactus. 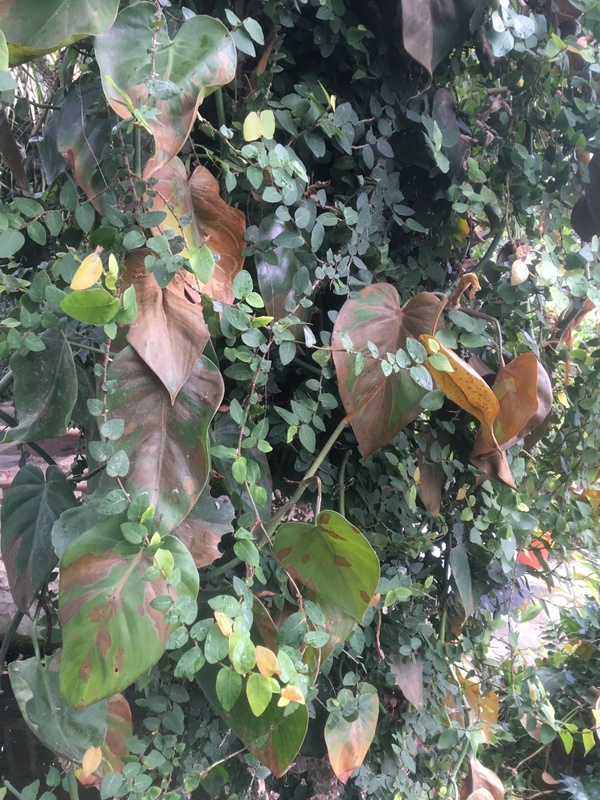 The weeping fig sometimes drops fruit, and is growing fast. We are in the middle of putting up shade netting to prevent the palms getting scorched. 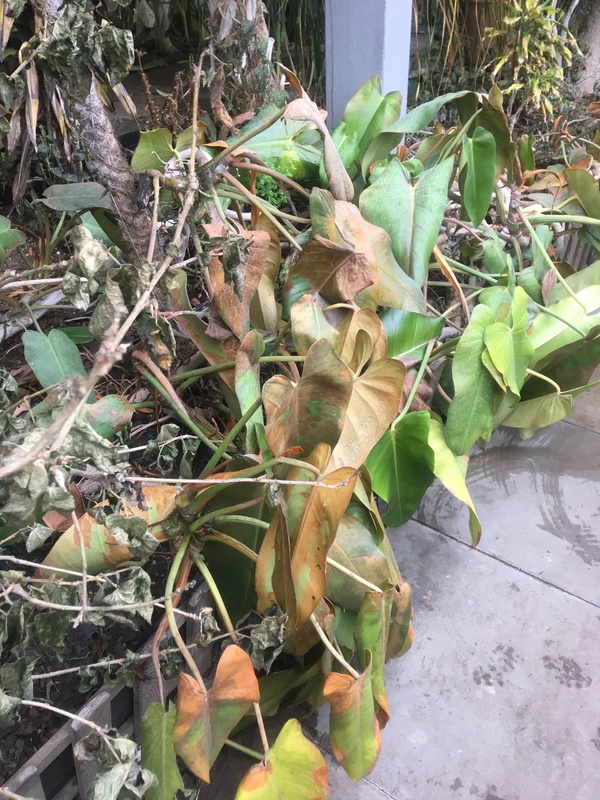 And – wonder of wonders – ficus trees, a lemon tree and lantana and some palms we thought had died have all put out strong new shoots and are looking very promising. And the fish had lots of babies too. Bring your water bottle and take a deep breath…it’s 39 degrees in there most days, but we’re working every Tuesday none the less.